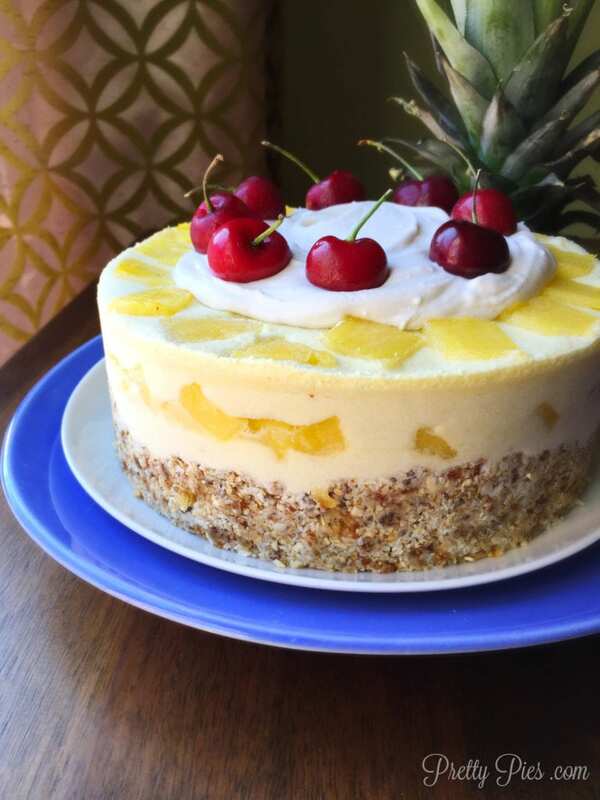 This is Emily from prettypies.com sharing a delicious (and nutrient-packed) dessert with you today– a recipe for Frozen Piña Colada Cake. 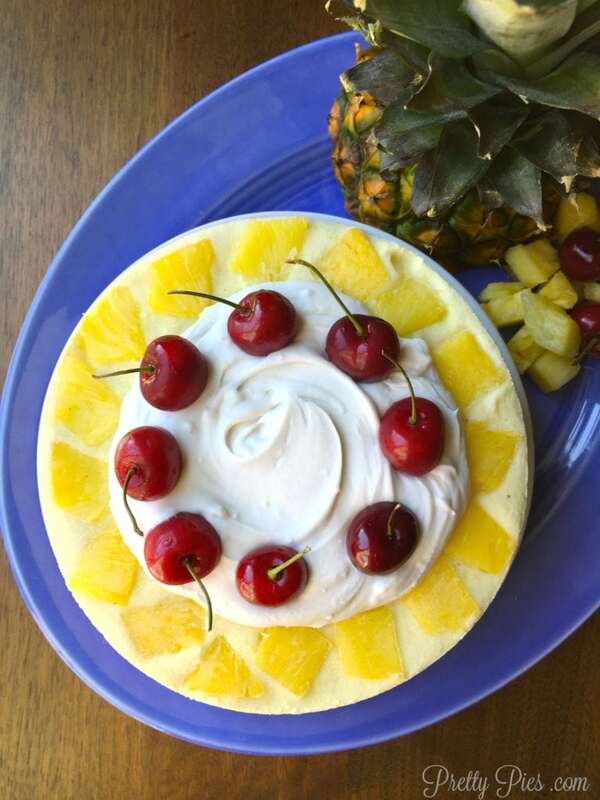 A creamy tropical treat that’s perfect on a hot summer day. Do you like piña coladas? I recently tasted my very first piña colada while on vacation. Omg YUM! I wanted to recreate the unforgettable flavor, but in a healthier way. This cake is made with fresh pineapple, coconut cream and very little added sugar! PLUS it has a secret ingredient that adds even more nutrients. You would never guess that there’s an ENTIRE zucchini hidden inside of it. Haha! Yes, vegetables in your dessert, because who doesn’t need more green veggies in their life? I promise you can’t taste vegetables. The zucchini actually makes it more creamy. This recipe is nut free, too! The crust is made of oats and coconut with the help of dates and chia seeds to bind it together. Healthy, whole foods and very little added sugar make this a dessert you can feel good about because it’s full of fiber, Omega-3s, Vitamin C, … the list goes on! And BONUS: you can instantly feel like you’re on vacation (even if you’re nowhere near the beach). Emily Spain is a mom, wife, and blogger at Pretty Pies where she shares recipes for beautiful, delicious and wholesome desserts made only from whole foods. She is a real-food enthusiast that is passionate about helping people discover the beauty of un-processed food by creating their own delectable treats. You can follow her on Facebook, Instagram and Pinterest. It’s hot outside, so cool off with this frozen tropical treat! 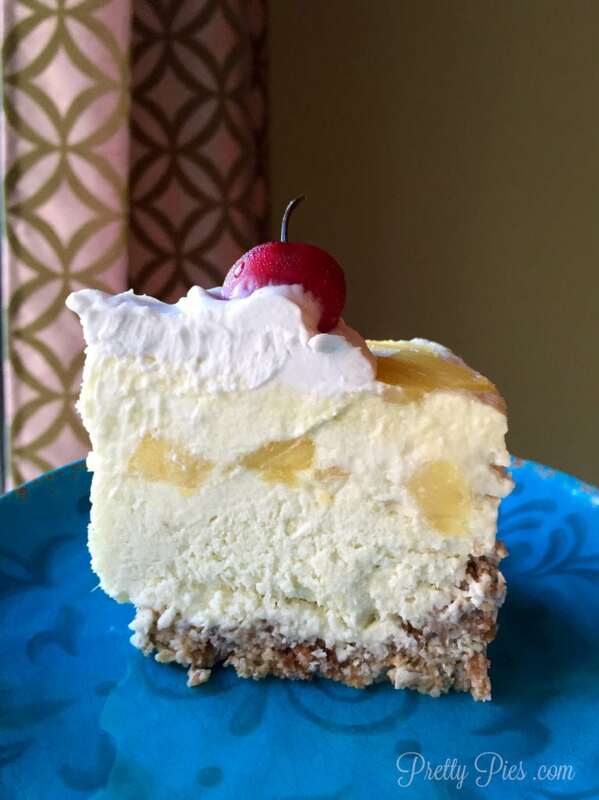 A cream cake that tastes like a piña colada, but so much healthier! Stir together chia seeds and water in a small bowl and set aside. Blend dates in food processor to break them up. Add chia mixture and remaining ingredients and pulse until sticky crumbles form. Press firmly into parchment-lined 7" spring-form pan. Blend 1 1/2 cups pineapple and zucchini in food processor. Scrape down sides. Scoop out the solid cream from 1 can of coconut cream, plus 1/3 cup of a second can (reserve the water for another use), and add in the remaining ingredients. Blend well. Pour 3/4 of filling into crust. 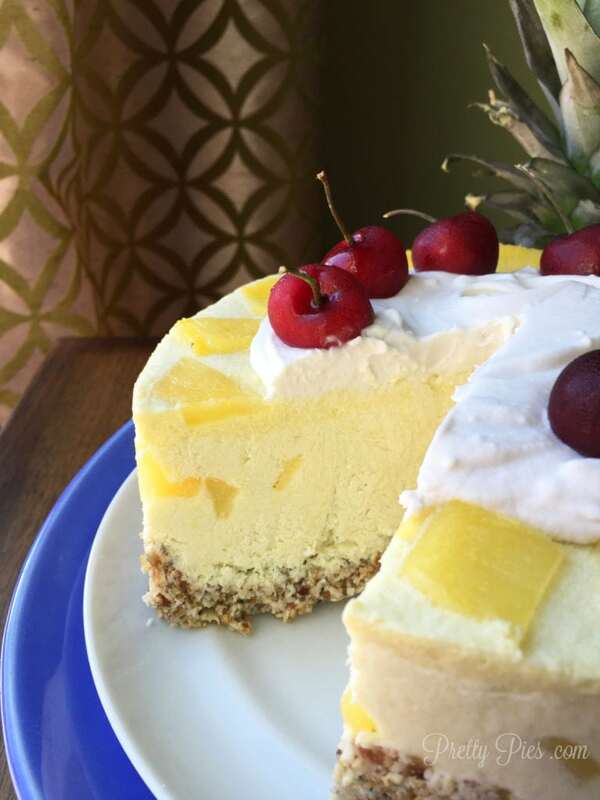 Place a layer of pineapple chunks on top of the cake (up against the edge, too). Set in freezer. Add a big handful of pineapple (roughly 1 cup) to the food processor and blend again. Pour on top of cake. Garnish with thinly cut pineapple and and set back in freezer for 3 hours to harden. Spread whipped cream on top of cake with a spatula. Garnish with cherries or extra pineapple. Enjoy! I don't know if you'll remember me or my comment about Westy on your post about the Westin Hotel in Westminster, CO (wow, that's a lot of "wests" in one sentence! ), but I just noticed your question about her and wanted to respond. Westy is the hotel mascot, hence the name, "Westy". She's a friendly-yet-aloof chocolate lab that you can ask to take or walks or just sit in the lobby with. I think she lives in the office behind the front desk. I'm a little confused...and unfortunately making this now...hoping an answer will come soon. I noticed not all the ingredients are mentioned in the directions so I an\m unsure when and where to add some of the ingredients. Ones I am unsure about: 1/4 cup coconut oil, coconut sugar, squeeze of lime. Also, for the first time ever my coconut milk did not separate and solidify on top. I've had it in fridge since yesterday afternoon...basically 24 hours. Any suggestions? will it harden up enough in the freezer if I just make it with the whole can? It looks so good & I've been dying to try this recipe so I am really hoping to get a response in time to still get this done...THANKS!!!! Sorry for the confusion. I think those ingredients go into the filling at the same time as everything else. As far as the coconut milk is concerned, every once and awhile you will get a dud that does not separate. It's happened to be before too and there isn't much you can do about it. :( You can try the freezer to see if that helps. I finally saw that it said "rest of the ingredients"....Sorry. I added the other ingredients to second layer, and I just used whole can in the pie & didn't have whipped cream on top. It might not thaw and stay together but it was delicious partially frozen. I had two cans and both did not separate, so I had to wing it...but seriously delicious any way!! Thanks!! Hi, Do you have the calories on this and the fat content? Thanks. I'm sorry, I don't. However, you can upload the recipe to My Fitness Pal for a rough estimate.